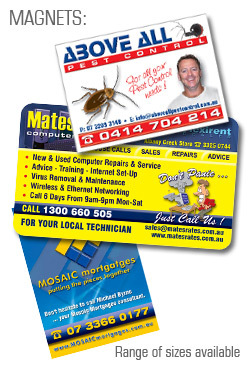 Probably our most popular print product, we truly offer the highest quality ultra thick, high resolution, full colour business cards available anywhere in the world with options like rounded corners to help you stand out from the competition. 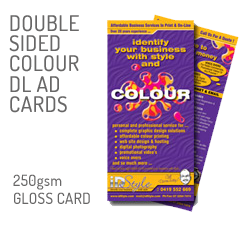 Did you know that it's usually less expensive to have your letterheads professionally printed in full colour, than it is to print your own in the office and it looks far more professional too. 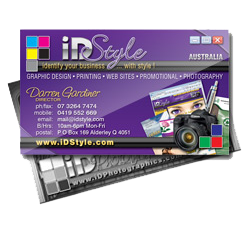 This is the professional way to accompany anything you need to send or give your clients. 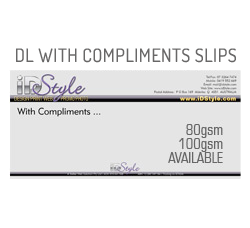 The DL size "With Compliments Slip" is an affordable alternative to using a full A4 Letterhead as you get 3 for the price of 1. 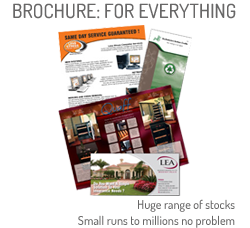 DL AD Cards are the most cost effective, result producing letterbox stuffer available as well as fitting neatly into a DL Brochure Stand taking up less counter space. They're also perfect for letting your clients know of a new product or service you're offering when you send out your monthly accounts because they fit in a standard business envelope. 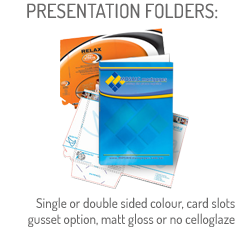 Brochures come in all shapes and sizes, paper thicknesses, double sided and single sided, folded and unfolded the list and quantities are are endless. So, if you're planning a brochure run, all we ask is the opportunity to quote. We're very confident you'll be pleasantly surprised with both our prices and quality. We've all been given those beautifully printed presentation folders by some huge national company that we believe can afford it and they do look impressive. A nice presentation folder really gives your client the feeling that they're dealing with a company that is truly professional in it's presentation and service. Presentation Folders aren't as expensive as you might think, can be printed one or both sides, celloglazed and come scored, ready to fold, insert your documents and business card to impress your client. Why not leave your clients, or potential clients with a truly practical and useful marketing tool that will stay in front of them, usually on top of their desk for everyone to see, for longer than a brochure usually will. 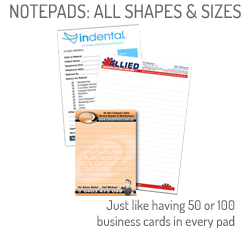 Notepads are a great way to market your business and put your name and message in front of them every day. You'll probably find that your name and message get's given to their customers when they write them a note. How's that for excellent but silent "word of mouth" advertising! 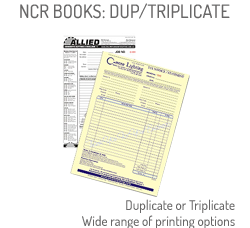 Invoice, Quote, Receipt, Order and Job Books are a necessary piece of stationery for many businesses, so why not make them look good, include all the information you really need and leave them with a lasting impression of professionalism with an NCR (Carbonless) Duplicate or Triplicate Book? Fridge Magnets are a fantastic way to put your name in front of people every day and if you couple that with a calendar, you give them a reason to look at it regularly. Fridge magnets are particularly good for business with a domestic clientelle. 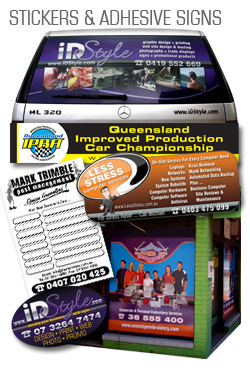 Whether you need a photographic quality micro-hole see through sign for your car window, or solid all weather printed sign for the entrance door, maybe a mass produced screen printed bumper sticker, a simple paper label, or even raised dome badges, we cover every avenue of design and production. Giving away promotional pens has been the staple of many company's marketing budgets for a very long time because they work. 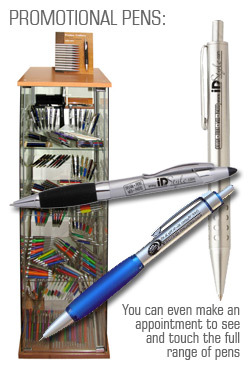 We have hundreds of different pens to suit all budgets. For use as a permanent display, or fold our brochure stand up and pack into the supplied aluminium briefcase for easy travel wherever you go. 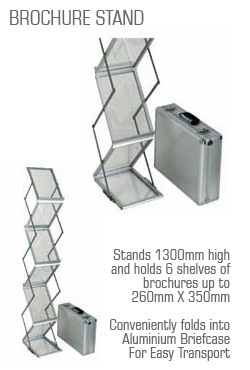 These are very nice brochure stands and they look great too. 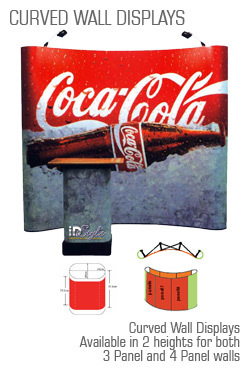 Now you can have a display that looks as good as those huge company's with an endless promotional budget at a fraction of the cost they used to be. Designed for fast assembly, compact transport, our curved wall displays really create impact. You can even use the transport case as your display counter. Every retail business facing the street should have a council approved* size A-Frame. 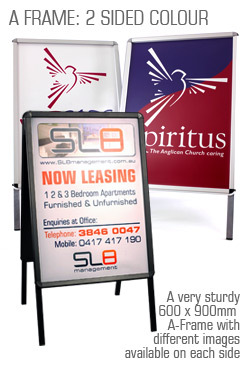 We supply our strong aluminium framed, double sided A-Frames with full colour printed signs and for a tiny additional set-up fee, you can have different artwork on each side. 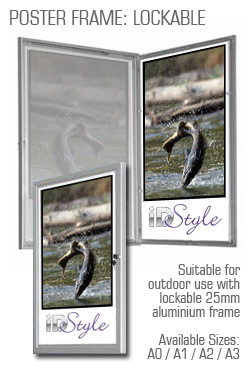 These very professional, strong and lockable poster frames are perfect for displaying posters that need to be changed quickly and easily outside your business and come in a range of popular sizes from A3 to A0. 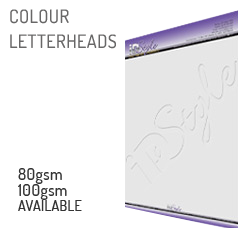 These very professional, snap edge poster frames make it quick and easy to change your photo or ad poster by simply lifint the four edges, inserting your artwork and snapping the edges closed. 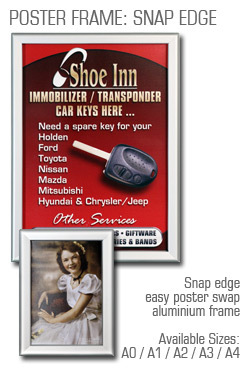 Our Snap Edge Poster Frames come in a range of popular sizes from A4 to A0. 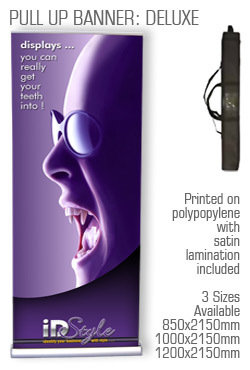 Very affordable, high resolution print, full colour pull up banners are a perfect way to get your product or service really noticed. Supplied with a heavy duty fabric carry bag for easy transport, our banners are available in a range of sizes, base designs and even double sided. 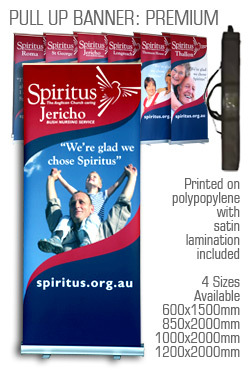 These truly deluxe quality pull up banners come with a heavier base, and are still printed in high resolution full colour. Supplied with a heavy duty fabric carry bag for easy transport, our banners are available in a range of sizes and even double sided. 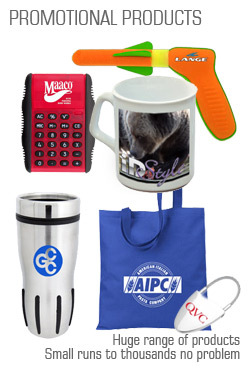 We have an enormous range of promotional products and personal print products that can be order in quantities from as little as one, through to tens of thousands. 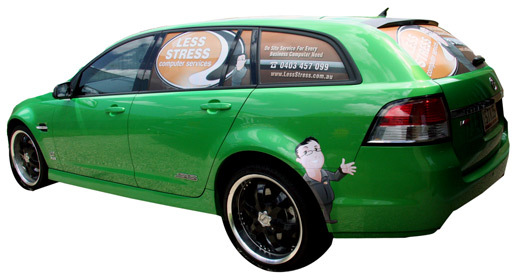 Do you own a nice car and would like to promote your business name or web site, but don't want to put rx pharmacy large highly visible signage on it? Here's a very new and nice way to do it. A little more subtle, very classy and doesn't make your vehicle look like a mobile billboard. From a business premises sign on the fascia of your factory, to the trading hours sign on the door, including signwriting the fleet for advertising that moves with you, we can provide design, print and installation services.